The SHIVA project arose from an interest in how culture may have a significant effect on the mode of visual perception a person uses. When we say ‘mode of visual perception’ or ‘perceptual mode,’ we refer to the particular way in which a person makes sense of scenes presented before their eyes. In the SHIVA project, we refer to a perceptual mode as something which encompasses a specific group of equations that the brain uses to draw conclusions from information derived by the retina. We think that the brain’s process of choosing this mode could be automatic rather than consciously controlled. Whenever the brain changes its mode of perception, its specific process of drawing conclusions is also changed, and a person will perceive things differently. Work done in the UBC VCL has revealed the possibility that a person’s visual perceptual mode can be changed. The change is measured by the use of a visual search paradigm called visual search asymmetry. Thus far, it seems that our subjects are not willfully changing their mode of perception, but rather their perceptual mode changes because of specific external factors in their visual environment. Our subjects seem to be unaware of any perceptual mode change occurring, so it is likely a subconscious occurrence. The SHIVA project is investigating factors which shift these visual perceptual modes. Some questions we ask are: What range of factors or external stimuli can affect these perceptual modes? To what degree are perceptual modes affected by these factors? Do some factors lose their effect on perceptual modes when certain other factors are present? Depending on what stimulus A is and what stimulus B is, you may consistently see either symmetry or asymmetry in visual search. For instance, studies show that searching for a target Q among distractor O’s is easier than searching for an O among Q’s. Significantly slower search times in one task suggests that the task is a greater challenge for the visual system. For example, take a look at the search task below. 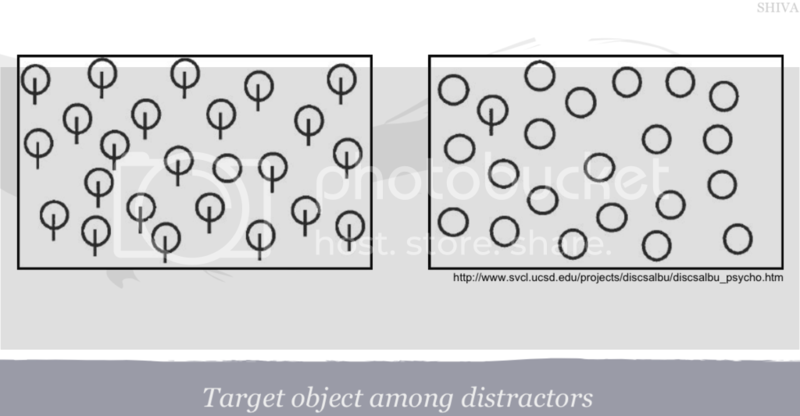 In the box on the left, try to find the target circle among distractor bisected circles. Now go the box on the right and try to find the target bisected circle among distractor circles. It’s fairly intuitive that one task is easier than the other. When this happens, visual search asymmetry is occurring. If a search for stimulus A among stimulus B does not produce different results from a search for B among A, then visual search is considered symmetric. Now let’s do the same search task, but instead of using circles and bisected circles, we’ll make stimulus A a short line and stimulus B a long line. When using these stimuli, we find that some people groups display visual search asymmetry, while others display symmetry. Why might we find these differences? The SHIVA team is investigating the role of perceptual modes as a possible suspect.